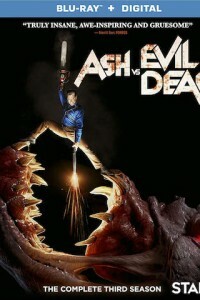 Legendary horror icon Bruce Campbell (The Evil Dead Franchise) stars in the “truly insane, awe-inspiring, and gruesome” (Merrill Barr, Forbes) final season of “Ash vs Evil Dead Season 3″ DVD. Experience the final season of the hilarious, critically acclaimed, most-watched comedy series on Starz that follows-up the classic horror film The Evil Dead. Alongside Campbell, “Ash vs Evil Dead Season 3″ also stars Lucy Lawless (TV’s “Xena: Warrior Princess” and “Spartacus: War of the Damned”), Ray Santiago (Meet the Fockers), Dana DeLorenzo (A Very Harold & Kumar Christmas), and newcomer Arielle Carver-O’Neill (TV’s “Worst Year of My Life, Again!” and “Suburbs”). “Ash vs Evil Dead Season 3″ features Ash, who – having gone from urban legend to hometown hero –discovers that he has a daughter. And, when Kelly witnesses a massacre with Ruby’s fingerprints all over it, she returns to warn Ash and Pablo.